Checkout is with paypal. You can just use a credit card. No login or account is necessary. If you prefer a phone order, see number below. 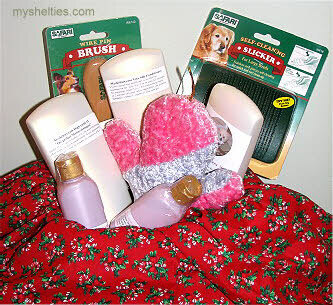 Four shampoos, Perfect for Shelties and other double coated, long haired breeds. 7 ounce or 16 ounce available. Gallon size available as special order at a special price. Plumeria Puppy Shampoo gentle for puppies or cats. *See full descriptions and ingredients at the bottom of this page. ** Hi-Yield 32 is an excellent multi task shampoo, and perfect for all breeds. It is very economical and easy to use. luxurious. Dilutes 32 to 1, can be diluted 16 to 1 for extra whitening effect. Super for double coated breeds. no MSDS sheet needed as these products are tested Non Toxic! include natural botanical extracts and oils, aloe vera, & vitamin E. Super safe and all natural! products, no MSDS sheet needed as these products are tested Non Toxic! Safari 451 Pin Brush & Slicker Brush. *Dries quickly and strongly and will not wash out. rolls up into a ball on the fingers. *Does not stick to skin. *Easy one drop at a time spout that doesn't clog. *Our ear glue comes in 2 convenient sizes. high set ears in most shelties with ease. We've done it! *Long shelf life when stored in a cool, dark cupboard. * No MSDS sheet needed as this is totally non toxic. Ear Glue remover comes in a lotion or shampoo. Only a dime sized amount is needed to remove the glue. With proper placement and removal may be necessary. 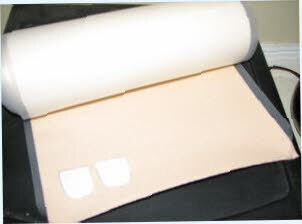 Professional Adhesive Moleskin- for use in holding up heavy ears in Shelties, Collies and other breeds. attach moleskin to the ear. You can get alot of ear pieces from one foot of moleskin! Collie or Aussie or ?! Perfect gift for the new puppy owner. 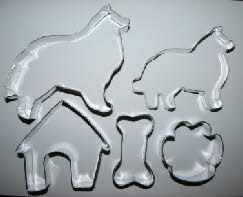 and 2 each of a dog housedog bone and dog paw print. Bacon and Liver flavor your dog will LOVE! Low fat and delicious!! A total of 12 dog cookies.